For Â¥230, you can just SIT in the boat! You pay extra to go farther and fartherer. How long is far in kilometers? How much for fartherererererererererererererererererererererererererererererererererererererererererererererererererererererererererererererererererererererererererererererererererererererererererererererererererererererererererererererererererererererererererererererererererererererererererererererererererererererererererererererererer? I need to get back to my planet. And if you double the price, we’ll take you back alive! What a deal! Please, keep fartherer me away China from. (Yen) 780 becomes when you go farthererer! boat two spots fartherer and you lose network…..go verizon buying! i’m on the run….i’ll do anything if u take me to the fartestestest safererest place with your boat!!! 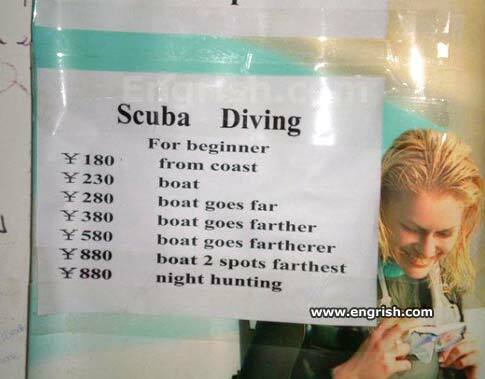 what a bargain…it cost me Â¥880 to go farthest night hunting with my boat. i cant believe believe i payed that other company Â¥1200 just to go 2 spots fartherer. I think I would get along well with the person who made this sign. Okay, they don’t really understand English, but could YOU come up with a way to describe 6 (!) different distances in a way that a native Chinese speaker could immediately understand? On a clear day, you can see foreverer. The mark Â¥ is normally used in China meaning Yuan (RMB), not Japanese Yen. That’s confusing. where does regular boat go? They pay you Â¥120 to scuba-dive in the sand onshore. The fartherer you go, the less you make sense. What about the home cost? Are they gunna hunt the begginers or somthing? This for beginnererer. You want boat that go farthererest, you need be experterer. …And don’t forget drifting directions…..Laugh and scream! 980 – Boat no return ! pay ¥10000 and you get to check the ocean floor in a body bag ! I didn’t know English had become an agglutinative language. This totally a cover for a prostitution outfit. they are now offering an exlusive farthererer round trip ticket. 850yen. scuba diving night hunting = catching fishes at night? Hey honey here’s your ultimate scuba diving and fishing experience. Go on! I won’t miss you, promise.